John Rollo's journey started earlier this year when he underwent a successful back surgery in Toronto. The morning after his surgery, John had a near-fatal heart attack and was rushed into emergency surgery. Life is a journey, and there are bumps and turns and potholes," explains John Rollo from his bed at the Hotel Dieu Shaver Health and Rehabilitation Centre. “I hit the biggest pothole in my life – and instead of it keeping me down - I am fighting my way back to be home for Christmas. He endured a triple-bypass and was in a sedated semi-coma for almost three weeks. With medication that channeled blood flow to his heart and chest area, John's feet suffered from a loss of blood resulting in an infection in both feet. That's when John arrived at Hotel Dieu Shaver. In early September, just two months after his back surgery, John's left foot was amputated just below his knee. 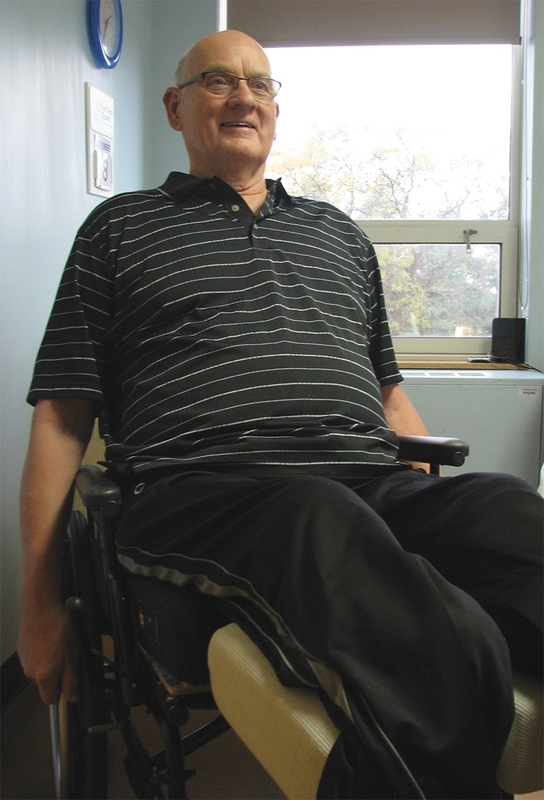 While his journey started in Toronto, John wanted to come to Hotel Dieu Shaver for his rehabilitation. Niagara is home for John and his family and it was becoming increasingly difficult to be in Toronto for months without family or friends close by. Once at Hotel Dieu Shaver, John's rehabilitation started slowly as his occupational therapists focused on strengthening his back. He also underwent speech therapy to correct speech impediments developed from weeks of feeding tubes and intubations. Unfortunately, the infection in John's right foot didn't heal and the decision was made to amputate his right leg under the knee. It was a shock at first," says John. “In June, I had two legs and now I don't – but I have a circle of family, friends, medical team of doctors, therapists and nurses who have been integral parts of my healing process. They are my Army of Angels. They saved my life and my wife Cathy, who has been by my side for 48 years, is my Chief Angel. With months of rehabilitation still ahead of him, John is grateful for the Hotel Dieu Shaver. My goal is to walk out of here at Christmas – and I know with my amazing rehab team – and with the support of my wife, kids, grandchildren and my family and friends – I am going to reach my goal. It will be a wonderful gift to myself to be home for Christmas. As 'Niagara's Centre of Excellence' for rehabilitation and complex care, we pride ourselves on providing comfort, care and hope for patients like John.